When a contact bounces on CommuniGator you can find out the reason they have bounced. This article will explain the reasons why they have bounced. This will explain the difference between a hard and soft bounce. If an email is a soft bounce, CommuniGator will increment a 'Bounce Count' by 1. Should an email receive 5 soft bounces, the contact will be set to undeliverable (hard bounce);. If you click on view results in your campaign and when you are taken to the results page click on export options. Select 'Bounces Hard/Soft' this will bring up a spreadsheet for you of the contacts and the reason they bounced. Finding the reason contact has bounced in the contact record. 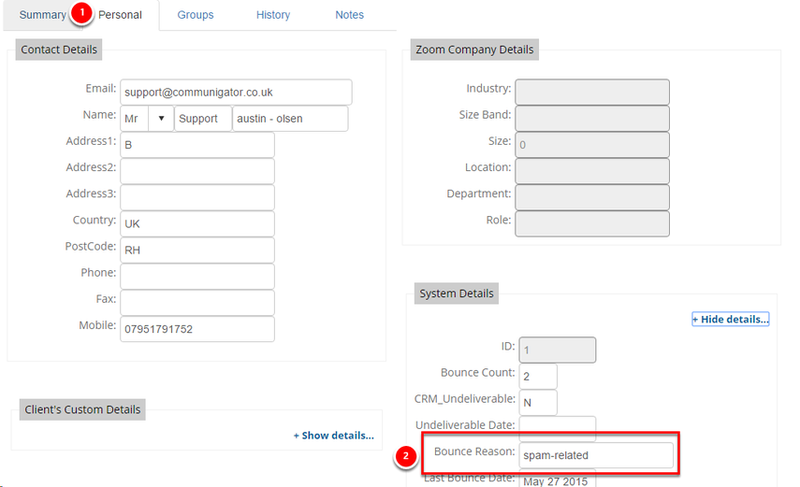 Zoom: Finding the reason contact has bounced in the contact record. By going into the Audience Tab within CommuniGator clicking on Contacts this will bring you the contacts page. Search for the contacts email e.g. support@communigator.co.uk and click into the record. By showing system details you will be able to view the bounce reason for this contact. Bad-configuration: Message rejected due to configuration issues with remote host. Soft Bounce. Bad-connection: Message bounced due to bad connection with remote host. CommuniGator can not connect with recipients server. Soft Bounce. Bad-domain: Message bounced due to bad or invalid domain. The domain (@communigator.co.uk) does not exist. Hard Bounce. Bad-mailbox: Message rejected due to bad, invalid or non-existant recipient addresses. The email address does not exist anymore but the domain does. E.g. that contact has left the company. Hard Bounce. Inactive-mailbox: Message rejected due to expired, inactive or disabled recipient address. Mail box will not be accepting messages. Soft Bounce. Message-expired: Message bounced due to not being delivered before the bounce-after. This means that the emails time stamp is considered to old to be sent. Soft Bounce. No-answer-from-host: Message bounced due to no response from remote host after connecting. Soft Bounce. Policy-related: Message refused or blocked due to general policy reasons. You are not allowed to send emails to the recipients server. Soft Bounce/SpamNotification. Protocol-errors: Message rejected due to SMTP protocol syntax or sequence errors. Soft Bounce. Quota-issues: Message rejected or blocked due to mailbox quota issues. This means that Recipient mailbox is full and does not accept any more emails at that moment. Soft Bounce. Relaying-issues: Message refused or blocked due to remote server relaying issues. This is a technical bounce. Soft Bounce. Routing-errors: Message bounced due to mail routing issues for recipient domain. The problem is not with the sender or the recipient, but somewhere in between. Soft Bounce. Spam-related: Message refused or blocked due to spam related reasons. The recipients server thinks you are a spammer. Soft Bounce/SpamNotification. Virus-related: Message refused or blocked due to virus related reasons. The bounce is a notification warning about a virus/code infected message. Soft Bounce. Other: Message rejected due to other reasons. This means that the recipients server does not give us the reason the email has bounced. Soft Bounce. Blacklist-related: Message rejected due to a blacklist. The recipients server has blacklisted your domain. Soft Bounce. Reputation-related: Message rejected due to reputation. Soft Bounce/SpamNotification. Complaint-related: Messages that were accepted but have then been complained about by recipient. This could mean they have move the email into their spam inbox. Hard Bounce/SpamNotification. Challenge-response: Message rejected due to a challenge response on the sender address not being a robot. This means that you are replied to by the recipients server asking if you are a genuine person or a robot, if you do not respond then your email will bounce as the server will assume you are a bot. Soft Bounce. Requires-auth: Message rejected due to a remote server requiring authentication for email delivery. Hard Bounce. Invalid-sender: Message rejected due to an invalide sender. Soft Bounce. Unknown: Bounce message from recipients server is not recognized. Soft Bounce.